A mudra is a hand position that balances energy in the body and clears the mind. Mudras were created by ancient yogis and chinese medicines to calm the mind, restore physical health, and optimize energy. Each part of our hands corresponds with a particular area of our brain and body. Mudras stimulate our glands, nerves, immune system and organs. By using specific hand positions on a consistent basis, we can communicate very clearly with our body and mind. I’ve been practicing and studying mudras for 30 years and they have become an integrated part of my daily life. Equally important for me is the daily massaging, rubbing and tapping of the hands. – This awakens our spirits, freshens us spiritually and lifts the mood. A wonderful and rewarding exercise after waking up in the morning. There are hundreds of mudras and I have practiced many of them at different times in my life. 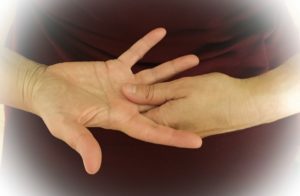 Today I am going to share four that are a great introduction to this practice and are some of the most widely taught mudras. Below you will find an discription of each mudra and its corresponding information. 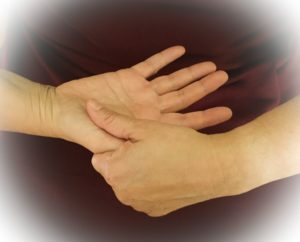 Grasp the left thumb with the four fingers of the right hand and place the right thumb against the root joint of the left thumb. – This expels feelings of sadness, emptiness and futility. It brings peace and serenity while awakening the inner fire, willpower, courage and confidence. Grasp the left index finger with the four fingers of the right hand and place the right thumb against the root joint of the left index finger. – This expels mental confusion, doubts and fears. It brings self-assurance, self-confidence and mental clarity. Grasp the left middle finger with the four fingers of the right hand and place the right thumb against the root joint of the left middle finger. – This expels tiredness, lethargy and indecision. It awakens the inner drive and desire to do something. Grasp the left ring finger with the four fingers of the right hand and place the right thumb against the root joint of the left ring finger. – This expels melancholy, feelings of loneliness and abandonment. It awakens creativity and the inner sun. Grasp the left little finger with the four fingers of the right hand and place the right thumb against the root joint of the left little finger. – This expels melancholy and indifference. It awakens the ability to love and to feel joy and inner peace. 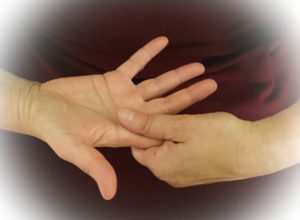 Hold the individual Mudras for 3-7 minutes then switch to the other hand and repeat the exercises for the same length of time. Very important: Concentrate only on what you want to achieve – on your goal. You can create a short film in your mind and speak corresponding mantras; I am so and so….., etc.